Almost every dancer has or will at some point have to deal with performance nerves. But how do you manage to turn fear into your ally and pull off a great and enjoyable performance? 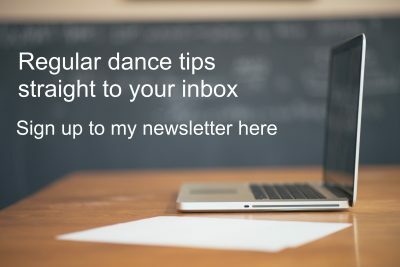 Read on for my top tips, share your own via the comments below, and get a free resource to help you dance better and more beautifully. Stage fright is quite a natural thing and even the greatest dancers, actors and other performers have a certain amount of nerves to deal with before they face their audience. It’s linked to our basic survival instinct, and to be fair, we can all feel very exposed on the stage, with everyone’s eyes on us. But the joy of the performance and the high that it can give you afterwards is all worth it, and the reason we all continue to push ourselves out there. ‘Feel the fear and do it anyway’ is the title of a famous book, and one of my favourite mantras. We are hard wired in our DNA to be cautious, and fear is there to keep you safe from harm and alive. But it’s not always rational, and thankfully stepping onto a stage to do a dance is unlikely to be life threatening in our part of the world. Nevertheless, your fear can seem very real. So acknowledged that its there and then decide to take the next step, which is all about keeping you as safe as possible. The scary thing about performing is that there’s always things that can go wrong. Some elements you can’t control, such as lights going off or even falling down, or the stage collapsing underneath you, which have all happened to me in front of large theatre audiences! But you can prepare a lot of your performance elements beforehand, which will help you feel more in control and comfortable. Rehearse your dance, and do it at least once in your costume and with your dance shoes, even if you’re planning to do it bare feet, as the venue floor may not be suitable. Wear all your jewellery and hair accessories too, especially if you’re dancing with a prop, as this might get caught. Always bring your music and a backup too, whether on iPod, phone, cd, memory stick or other. Always check what can be used, as technology can fail. No music, no dance performance. Everyone’s biggest fear when performing is when the mind goes blank, and to be honest it probable will do at some point, so that’s when all you can do is improvise. I realise the word alone can send shivers down people’s spine, but it will save you over and over again. If you stop moving everyone will know that somethings wrong, and the same goes if you mouth any words or allow your face to show the panic that you may be feeling on the inside. So what do you do? My advice is always ‘shimmy and smile’, meaning perform a basic move that fits with the music, whilst you gather your thoughts, but the smiling part is also very important, as it will keep your face from frowning, and even better, it will help the majority of your face and neck muscles to relax (unless you clinch your teeth whilst smiling – so please don’t do that!). You can download my free ’10 Tips for Better and more Beautiful Dancing’ here, for more inspiration on how to improve your overall performance. It sounds obvious but knowing your music is essential, especially if your mind should wander. It will help you improvise, which in many ways is more necessary than remembering your choreographies. If you’re doing a solo you can do anything that you want, as no one will know your routine, but dancing in a group or with a partner is of course more challenging. However the advise is the same, ‘smile and shimmy’! Don’t stop moving and remember that no one in the audience can look at everyone dancing at the same time. If they look at you and you’re still moving and looking in control, then they’re not likely to notice that you’ve made a mistake. You can of course look at your troupe members to help remind you what steps come next, but please do so discretely, so again, no stopping or starring. You will have to look, or at least pretend to look, at your audience when performing. A dancer who’s constantly looking at the floor or ceiling isn’t engaging to watch. Your choreography can be ever so amazing but still leave your audience uninspired if they can’t see your eyes. Again, this is linked to what’s already coded into our DNA and how we read and interpret body language. Use this to your advantage when dancing and incorporate it into your choreography. Utilise the old acting technique of looking just above people’s heads, or even better, between their eyes. But be careful not to turn it into an aggressive stare! Stage lights can also be useful to look into, but only every now and again. Naked audience: Not necessarily something to think about mid performance, but especially before going on stage, it can be good to remind yourself that you aren’t fighting lions or performing in front of the Gods. Your audience consists of normal people, and if they were all naked they’d probably seem a lot less scary to you. Clench your gluts: It may not always work depending on your dance move, but contracting your bum muscles and getting the focus and tension into your gluts can be an excellent way to gain control, especially if you can’t feel the floor due to nerves. This is also a great technique if you have to give a presentation or speech in front of a large crowd of people. It basically helps you to feel your body instead of floating around in your head. Ideally you want to take it one step further and get the focus into your feet. This will help you stay grounded throughout your performance and of course move better too. I am currently putting an entire course together on ‘Stage Performance and Acting Techniques for Dancers’. You can pre-register my sending me an email here, and you’ll then be the first to know when it launches so you can securer yourself the early bird rate! You can also download my free resource ’10 Tips for Better and more Beautiful Dancing’ here. Have you got any tips that you’d like to share with fellow dancers? Have you ever been on stage and had to deal with something unexpected? How did you do it? Please use the comments below to share your tips.